In Monster Hunter Freedom Unite for the PSP you are a hunter that needs to kill or capture lots of dragon-like creatures. You can fight alone, or go to the Gathering Hall to hunt with your friends. If single player is more your taste, you'll never have to be truly alone as you can even hire some Felyne Comrades. These are cat-like humanoid creatures that are willing to die for you in the heat of battle with giant monsters. As you travel across snowy mountains, go into deep forests and climb volcanic mountains, you will face tons of different monsters, all eagerly awaiting your challenge. There are literally hundreds of items at your disposal, including eleven weapon-types. These weapons not only have a attack powers, but can be used to buff you up. The Hunting Horn is a good example of this. While some of these items take a long time to find and collect, the reward is usually worth it. Like any good co-op RPG, showing off your looks is part of the fun, and there's plenty of good looking armor to be had and upgraded. Monster Hunter Freedom Unite has more than 300 quests, so getting bored is never an option. Hunting yields a few options; you can kill monsters, cut their tails and horns off for extra reward, or you can even capture them if you and your team are able to weaken them enough. Each method has it's advantages, but whatever you choose you'll be able to use materials from the monster to make better equipment. The monsters range in size from small, large and HUGE beasts. I say HUGE because some are as big as a mountain. You can jump on their backs to bring them down, or defend a Fortress from them by using cannons, ballistas and the secret dragon-killing weapon: the Dragonator. You can't just win by mashing your way through the missions. To conquer these beasts you'll need skills from the various armor, weapon and decoration combinations - but most of all you'll need teamwork. 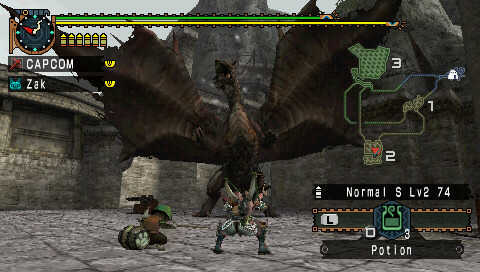 While Monster Hunter Freedom Unite can be played in singleplayer mode, most gamers will find it a bit too difficult. This is why the fun really starts in the Gathering Hall. This meetup section is where you and a couple of friends can start various quests and try to complete them in groups of up to four players. You can share your Felyne Comrades with your friends, you pimp, or trade items and Guild Cards. These Guild Cards are used to keep track of your friend’s progress. If you are playing with your friends, you can give them items in-game, track different monsters while on the field, and help each other out. Cooperative play involves some fancy teamwork to bring down these large creatures. For instance, while you shoot paralyzing shots from your Bowgun that immobilizes monsters, the other players can buff you up with their Hunting Horn's musical powers, and another player can cut the Wyvern's tail clean off with a sword. This kind of teamwork is essential because the monsters are even tougher than in singleplayer. In solo mode, if you die 3 times then your quest is over. In co-op mode, if the total amount of deaths is three between the players then everyone's quest is over. As we've covered before, there are some special event quests that appear every week in the game’s Download section which can also yield various bonuses. Playing it in Co-Op is a blast. But it does have it's downside, you can only play it in AD-HOC mode. There are ways around it so you can play online with 3rd party programs, but this isn't ideal. 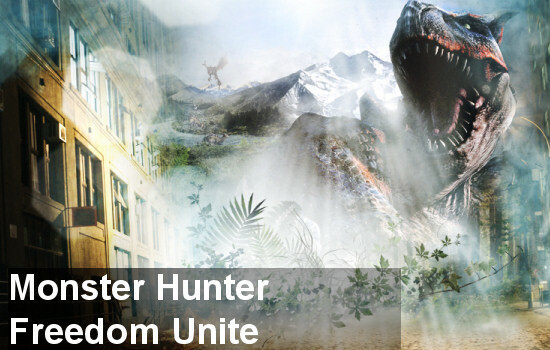 Still, if you can find some friends to play with, Monster Hunter Freedom Unite isn't just addictive - but fun. 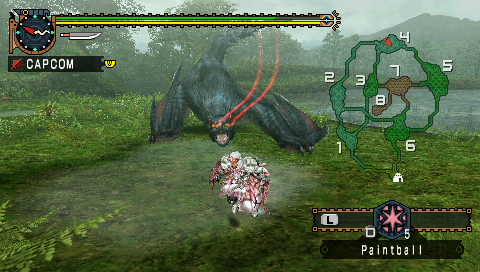 The Co-Op Experience: Using the PSP�s wireless Ad-Hoc connection, players can adventure with up to three friends for a savaging multiplayer hunting party. From devising the strategy to executing the attack, players will need to work together in order to hunt down the ferocious beasts and progress through the wide range of quests on offer.